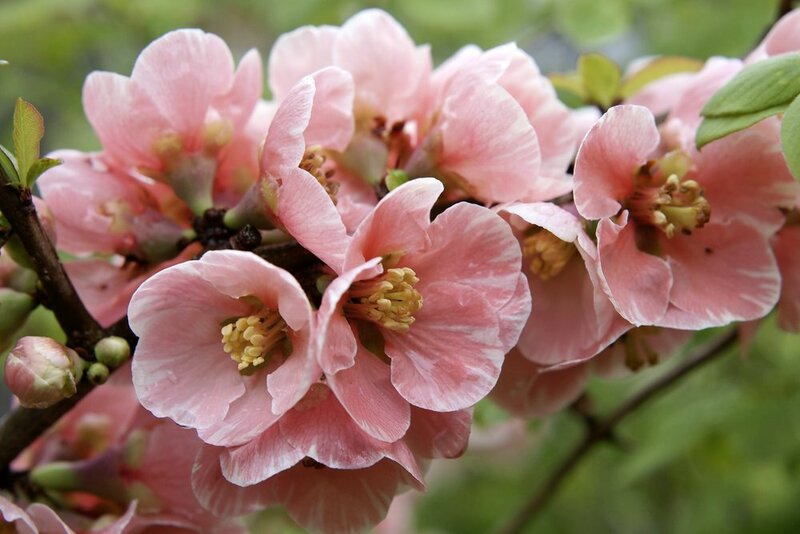 Once the colourful blooms of the Japanese flowering quince, or chenomeles, appear it’s a sure sign that spring’s on its way. Their vibrant to pastel tones in glowing red-orange, through pink to white are a dramatic contrast to the shrill yellows of daffodils and forsythia, adding to the colourful cacophony of spring. They’re also useful for feeding hungry bees and other early pollinators stirring into life after winter hibernation, and on bright, fine days can be abuzz with competing insects. After the flowers they produce hard, aromatic, tennis-ball sized fruit, which turn yellow, sometimes flushed red in autumn, and when ripe can be used for making jams and jellies. The yellow autumn colour of some types adds to the autumn scene. Most of the varieties we grow in gardens come from two species, dwarf C. japonica from Japan, the much larger C. speciosa from China, and a hybrid between themC. superba, which has spawned the largest number of varieties. These durable deciduous shrubs produce their long-lasting blossom at the base of bare, stubby-spined branches, just before the narrow, shiny-green leaves appear. Adaptable, chenomes will grow in most situations, in sun or in colder, shadier north or east-facing locations in most soils, even heavy clay. They are also tolerant of pollution, so ideal are for city locations. While choosing your preferred colour, also keep in mind their growth habits. Some are compact, growing to around 3-4ft, others are much larger at 2.5m (8ft). Some are more upright, rather than spreading, lending themselves to being grown and trained against a wall or fence. They can also be clipped into an informal hedge. 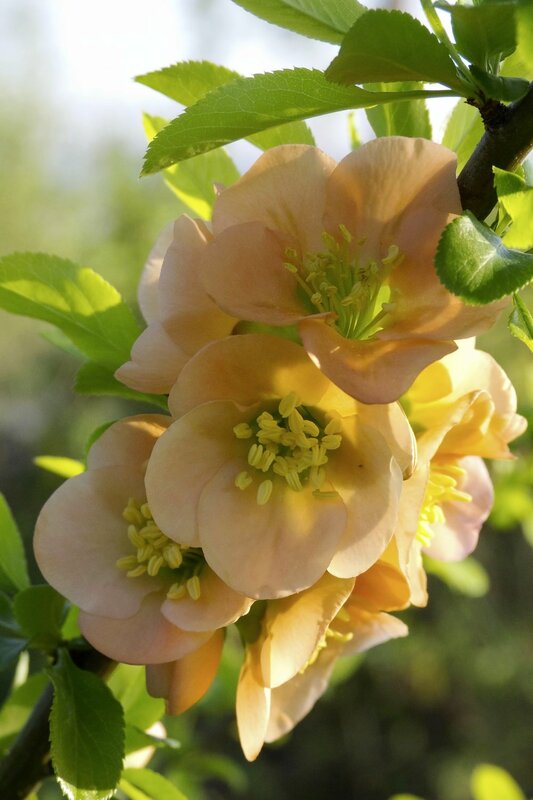 Prune chaenomeles immediately after flowering, reducing wayward stems to 2-3 buds and thinning out congested growth and old stems, to encourage fresh new shoots, which will flower the following year. Mention bearded iris and most people think of those flamboyant tricornered blooms held aloft on stiff ramrod stems in May. Often overlooked are the dwarf kinds of these iris which are no less dramatic, but produce their multi-coloured fleur de lis flowers much earlier in April, on 18-40 cm (8-16in) stems allowing the blooms to hover just above or among a clutch of pointed blue-green leaves. 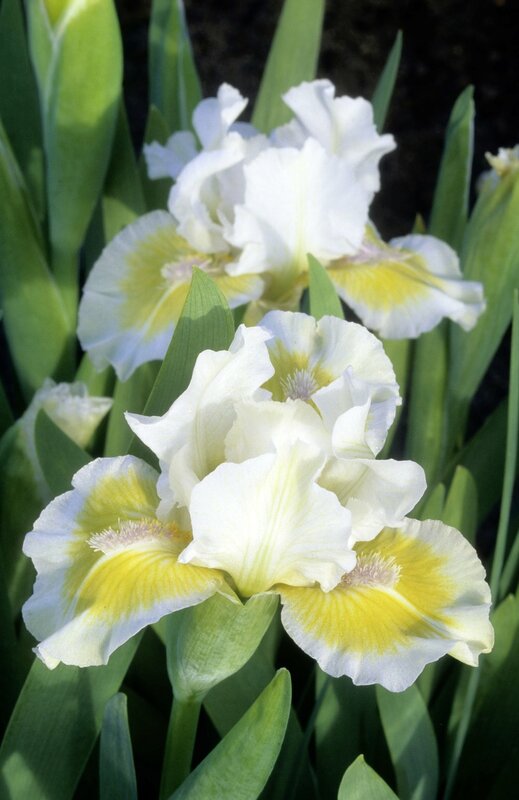 Known as Standard Dwarf Bearded iris they are a relevantly recent creation, first appearing in the USA in the late 1950s and 60s. Geddes Douglas of Tennessee posted pollen of his tall bearded varieties to Paul Cook of Indiana, 500 miles away; he grew dwarf species I. pumila, and in turn returned the favour. The resulting offspring of different heights were selected and named, with their original ‘Green Spot’ and ‘Lili-white’ varieties still available. Older varieties tend to have drooping fall petals, while in modern hybrids the trend is for horizontal fall petals, which gives them more presence in the garden. They can can be grown with other creeping perennial and alpine plants that like full sun, such as Thymus, Phlox douglasii, Geranium sanguineumand Veronica repens. 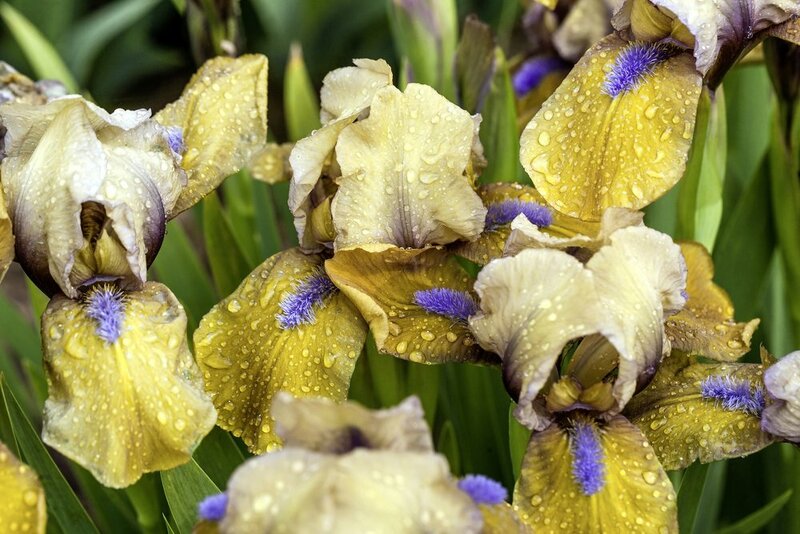 Dwarf bearded iris need the same conditions of moist, well-drained soil and full sun, with rhizomes exposed so they ripen in the summer sun to stimulate blooms for spring. They need an open site not shaded or swamped by expansive perennials. Like their larger cousins they can be lifted every three to four years in July, and divided, planting only the youngest rhizomes, each complete with a fan of leaves, leaving the surface of the rhizome open to the sun. From December into March Christmas and Lenten roses lift our gardens with their considerable floral charms. While the development of stronger, clearer colours and flower shape grab most of the headlines, alongside has been a quieter, but no less important revolution in patterned foliage, a feature that endures long after blooms are over. Colourations span mottling and flecking, silvering and marbling of veins, to silvering of the whole leaf surface. A number of different species and hybrids are involved, each with its own particular character in terms of habit and the way the flowers are formed and held, some on stout stems also supporting leaves, others on multiple slender stems from the rootstock. Their foliage is evergreen or semi-evergreen, selected for durability and visual impact, significantly boosting their usefulness in the garden. 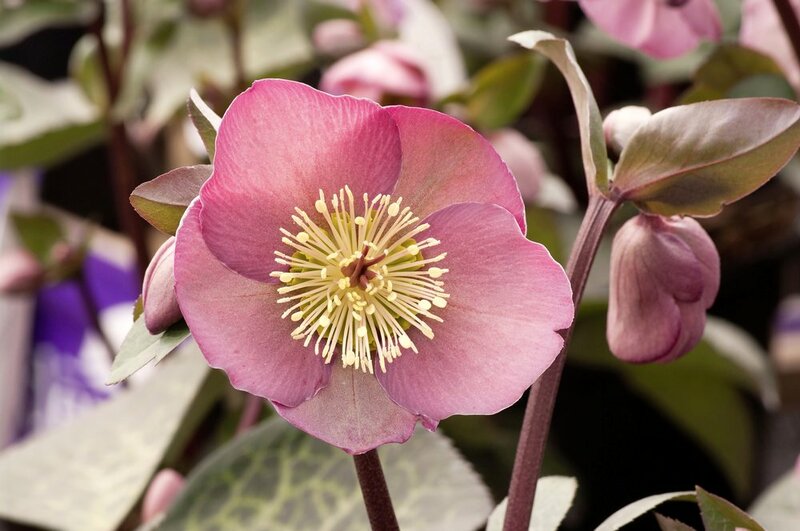 Blooms tend to have a quieter charm than those specifically bred for their flowers, spanning white, cream and lime-green, to dusky pinks and bronze tones, often changing colour as they age. This said they have a presence that complements, rather than competes with or detracts from the foliage. Many have outward facing blooms, rather than pendant or nodding as with large proportion of H. hybridus varieties. The hellebores listed are easy and rewarding to grow, but take care to provide H. sternii‘Silver Dollar’ with a warmer, sheltered spot to keep it in good condition. 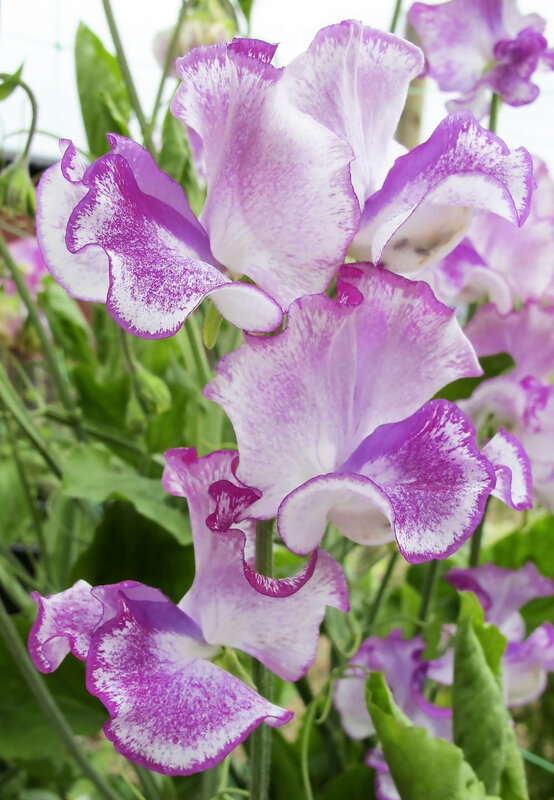 They will luxuriate in dappled or semi-shade, in most moist, well-drained soils rich in organic matter. Avoid those prone to drought or are waterlogged in winter. 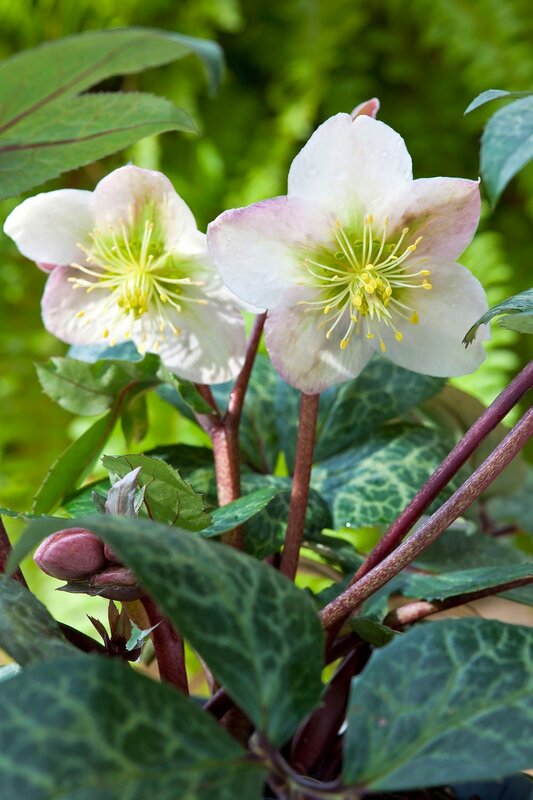 To keep these hellebores looking their best prune away older foliage as new leaves emerge and remove spent flower stems in late spring and feed with a balanced general purpose fertiliser. Dwarf gladiolus are becoming essential components of the garden as they provide exotic-looking early summer flowers on stems only half the height of their taller, later-flowering hybrid cousins. Shorter stature means they don’t need staking and make good gap fillers among establishing or small perennials or ornamental grasses in sunny borders. They can also be grown as cut flowers or you could grow them in pots for a lovely patio display. MediterraneanG. byzantinusand South African G. papilio‘Ruby’ will naturalise in beds and borders once they have established. Dwarf gladiolus are derived from a range of types, namely the loose group of small-flowered hybrids variously known as Nanus,Primulinus , TubergeniiandG. colvillei. The original G. colvilleiwas bred back in 1823 by London nurseryman James Colville by crossing South African G. tristisandG. cardinalis,but nowcontain hybrids with other species in their blood. All have butterly-shaped blooms on a single spike, although some varieties may produce multiple spikes, particularly from premium size bulbs. There are an astonishing range of colours and colour variations from subtle to vibrant, the only downside being that none are fragrant. In spring plant gladiolus corms 8cm (3in) deep and 15cm (6in) apart in moist, well-drained soil in full sun. Plant in groups of 7-15 bulbs to generate impact. Remember to mark the spot to prevent accidental plantings before shoots emerge. Once flower buds have formed feed them with a high potash fertiliser. After flowering allow foliage to die back naturally, keeping the planting area open to help ripen the new corms. Most dwarf kinds are fairly hardy and can be left outdoors over winter, rather than being lifted and stored, as with the larger kinds. In cold winters protect them with a mulch of bark or composted straw. Here are some varieties to try. Click the images for more information. 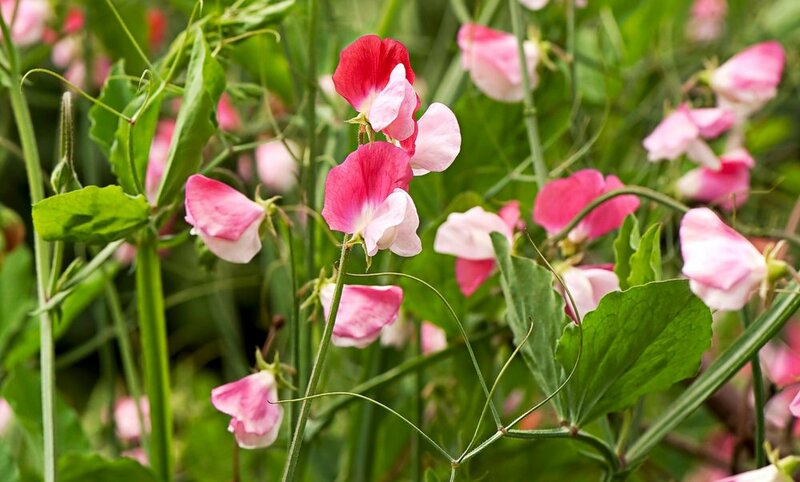 Early-flowering varieties to get your garden off to a flying start. Camellias are the doyen of early-flowering shrubs, producing a succession of fabulous waxy-textured flowers nestled among glossy evergreen leaves, that can, in turn be demure and understated to bordering on the outrageous. Some are even sweetly scented. While the main season of flowering spans late winter into spring a number of varieties welcome in the new year with a fanfare of blossom, at a time when such floral treats are especially welcome, particularly given the fact that they thrive in shadier parts of the garden. Forms span those coming from Camellia japonica, the hybrid C. williamsiiand additional hybrids derived from a range of species. This has imbued them with a range of growth habits, from compact to more open, so check the habit and growth rate before purchasing. In general C. williamsii hybrids are more tolerant and flower more prolifically in lower light levels than C. japonica types, and drop spent flowers, rather than requiring dead-heading like C. japonicatypes, especially the older varieties. This said C. japonicahas a far wider range of colour and flower form than C. williamsiiwhich comes in white, pink and red. Camellias thrive in soils which are neutral to acid, preferring light, sandy loams rich in organic matter. They thrive in semi-shaded conditions, even growing in full shade, but flowering is often not as prolific. If training and pruning them to grow against a shady north facing wall or side of a house, choose varieties that are more upright or open in habit. Prune plants after flowering is over and new growth has not yet started. You can also prune new growth back by half to maintain a shrubbier habit. If living in an area with chalky soil you can grow them in pots, using ericaceous compost. Being shallow rooted they are better in tubs or half-barrels than tall, narrow pots. Feed with an ericaceous liquid fertiliser and if possible irrigate them with rain water. Wherever you grow them don’t allow plants to dry out in summer at the point the buds are forming as is likely to cause them to drop. An amazing range of forms await gardeners willing to seek them out. Our fascination with snowdrops goes on unabated with bands of enthusiasts scouring the ground in snowdrop havens throughout January and February. Their prize is discovering a new variant of this much-loved winter flower, which, in the rarest forms can change hands for hundreds of pounds per bulb. Over many years a mind-boggling range has been introduced. 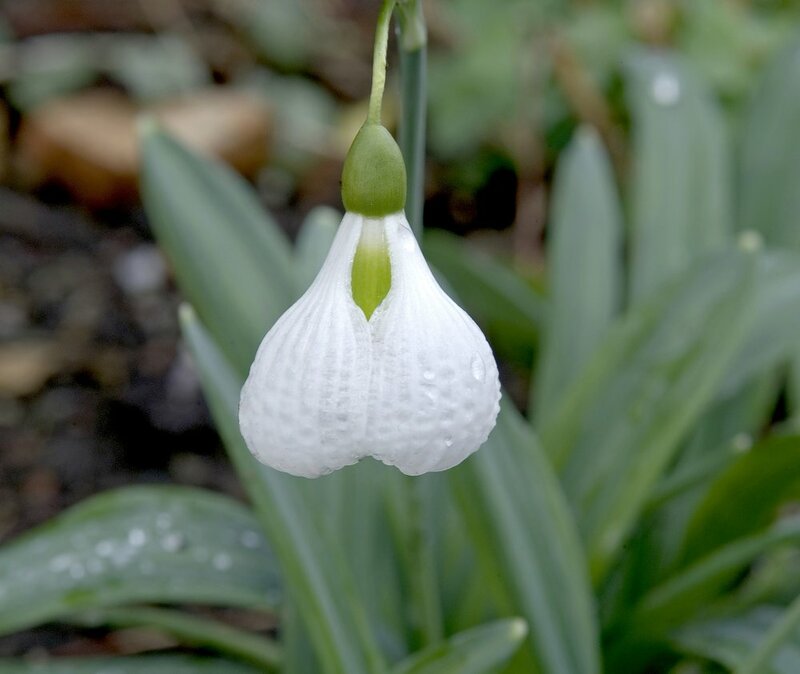 Most are found by accident, others specifically bred or selected, as the snowdrop is a promiscuous soul, easily crossed and setting quantities of viable seed. Fanciful or descriptive names often accompany each new form. The most garden worthy and vigorous have been propagated, bringing down the price to suit more modest pockets. You can also grow them in pots of well-drained peat-free compost, so that their qualities can be appreciated up close, and before you know it you’ll be hooked and wanting more. Many of the latest and hotly contested appear on on-line marketing sites such as e-bay, and in the dark days of winter it’s a treat to visit such outlets to see what’s going on. 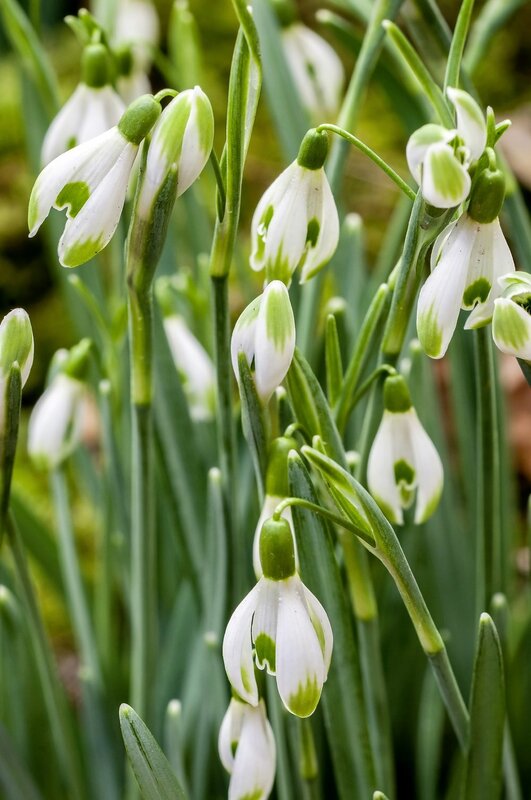 Named forms of snowdrops should only be propagated by splitting up clumps of bulbs, ideally when still ‘in the green’, meaning in leaf, after the flowers have just gone over, until late winter, when the foliage is just starting to die back. Lift the bulbs and divide into single bulbs or small clumps, replanting at two bulbs or 50mm (2in) apart. Plant in soil containing plenty of organic matter in semi-shade and water in. The soil should not become exposed to prolonged drought in summer. Mark the position of the bulbs, and cover with fine mesh to help protect the bulbs from mice. To avoid your collection becoming diluted with hybrid offspring, remove seed pods before they mature. Individual bulbs can be propagated by twin scaling or chipping, which involves severing individual bulbs into chunks, with leaves attached to the base plate, but is a technique that requires some experience. Given warmth, these tender shrubs will bloom for you all year round. Abutilons are the eternal performers of the garden, continuing to produce their colourful bell-shaped flowers throughout the year if housed in a warm conservatory or heated greenhouse. There are over 200 species of abutilon, which come from tropical and sub-tropical parts of North and South America, Africa, Asia and Australia. 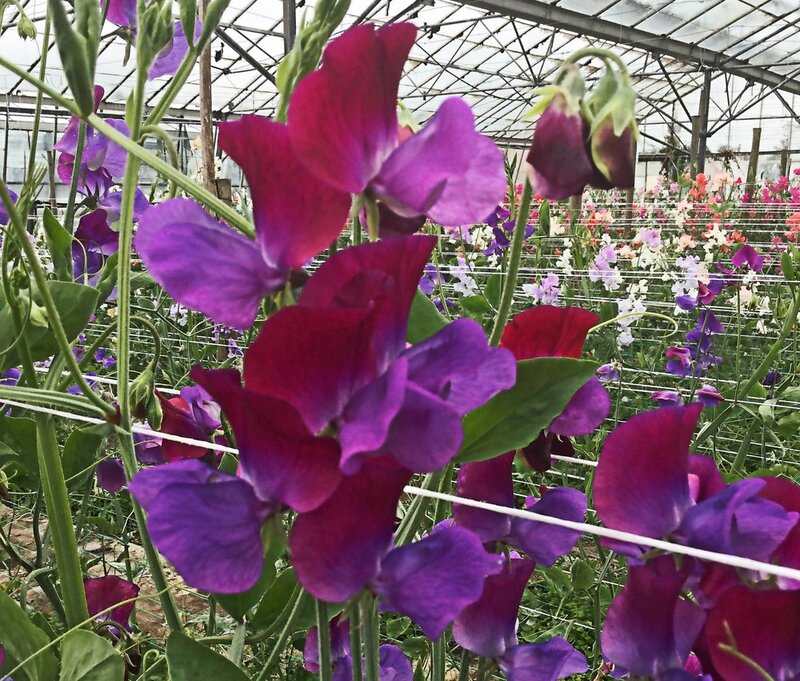 While some are hardy enough to be grown outdoors in the UK, most are too tender, traditionally used as glasshouse plants, summer bedding or patio plants, brought indoors in winter. Most are complex hybrids, bred from sub-tropical and tender South American species such as A. darwinii, A. striatum, A. megapotamicum and A. pictum. Once popular in Victorian times they are currently enjoying a renaissance with exciting new varieties appearing each year. Abutilons form open, brittle- branched shrubs, clothed in soft, maple-like leaves. They can achieve upwards of 4m (13ft), but usually are much shorter in pots or when bedded out. The pendant flowers, often in clusters, are produced on the tips of new growth, so if kept growing they will continue to flower, even in winter in temperature of 15C (59F). Lax-stemmed A. megapotamicum and its close hybrids, such as ‘Kentish Belle’ are hardier, and can be trained and grown on a warm, sheltered, south-facing wall in the warmer parts of the UK, over-wintering more reliably in well-drained soil. Grown in pots, they enjoy most composts, but particularly loam-based such as John Innes No 3, or blends of John Innes and peat-free, as long as they are well-drained. They respond well to feeding with a high potash fertiliser. They can also be pruned in late winter keep them in shape and more compact. You can use the stems as cuttings or wait for fresh soft-wood stems in late spring or early summer. Summer-flowering angel’s fishing rod or fairy wand have an elegant charm all their own. Angel’s fishing rod or dierama are one of those plants that always cause great excitement in the garden when their arching, wiry flower stems burst into bloom. They’re unlike any other flowering plant we grow in our garden, and their distinctive character makes them ideal for poolside plantings or dotting among other grassy plants. These semi-evergreen perennials from South Africa grow from small corms, rather like crocosmia, producing a sheaf of narrow blue-green foliage about 1-3ft in height, depending on species and variety. Wiry wands appear in July, till early September, arching like an over-stressed fishing rod as the bell-shaped blooms successively start to open along its length. Flowers come in shades of pink, purple, coral and white, with flower sizes again varying from species to species, but usually 60-75mm (21/2-3in) across. There are also pale-yellow flowered species, but these are rarely seen in UK gardens. Slieve Donard hybrids are one of the earliest selections, created in the 1950s and 1960s by the Slieve Donard nursery in County Down, Northern Ireland, but more recent breeding has seen the King Arthur series, named after various characters of the myth, start to become popular. Angel’s fishing rods need space to allow the airy flower stems to have impact, and look dramatic if planted in a drift in a gravel garden or open border. They also look effective by a pool, but don’t want to be planted as a marginal in wet soil. Ideally, they prefer a fertile, moist, well-drained soil, but don’t like drought, which causes the leaves to die back, or wet, waterlogged conditions in winter, which causes corms to rot. Plant nursery-grown clumps in late winter or early spring, but remember they take time to establish and flower reliably. They also take time to settle after lifting and dividing, the only way to reliably propagate named varieties, either in late winter, or after flowering in late summer. Species are easily grown from seed under glass in spring, taking a couple of years to grow to planting size, and around five years to flower. As leaves look rather bedraggled by the end of the year carefully clean out dead stems which tend to congregate with a hand rake in early spring. Witch hazels now come in a variety of warm and vibrant tones. Hamamelis, or witch hazels, are one of the real delights of the winter garden, their sweetly fragrant ribbon-like four-petalled blooms that wreath their bare branches are always guaranteed to welcome in the New Year over a number of weeks. These deciduous shrubs from the USA, China and Japan are also known for their striking orange, yellow and red autumn colours. From the four species, namely the two American, H. vernalis and H. virginiana, and two Asian, H. japonica and H. mollis, it is H. intermedia a hybrid of the two latter species which has yielded most new forms and as a consequence is the most widely grown. 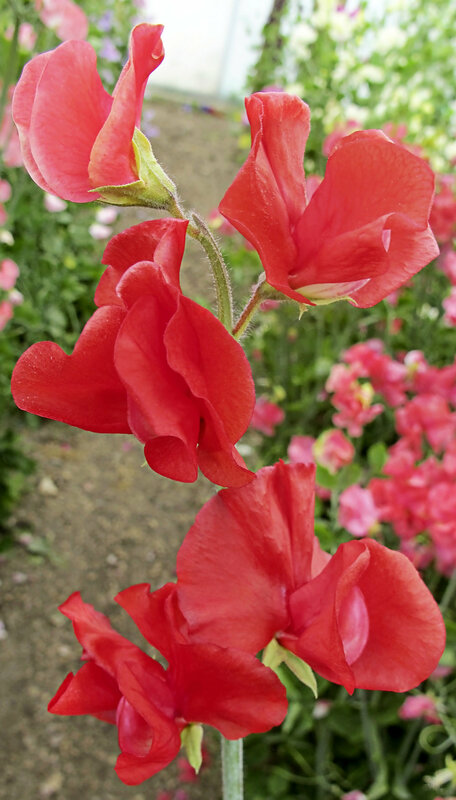 Recent selection and cross-breeding, also using the smaller flowered American varieties, has generated forms in red, orange and bronze tones, in some cases overlaid with two or more shades. Not all rustic-toned varieties are as strongly fragrant as their yellow counterparts, such as popular H. intermedia ‘Pallida’, so take a sniff or ask for advice before buying them. Hamamelis are expensive, particularly if you buy a specimen-sized plant, as they are grafted and take time to grow. Some of the newer and novel varieties can be more difficult to come by, so you’ll need to be patient and search them out. They grow in most moist, well-drained soils, happiest in those which are acid to neutral, but will struggle on shallow chalk soil which dries out in summer. While thriving in semi-shade they flower more productively in full sun, but help keep soil moist in summer by mulching. Being surface rooting, spread out rather than bury roots when planting. Although you can leave them to achieve their ultimate size and spread, around 13ft over 10 or more years, you can keep them more compact by pruning them after flowering. Simply cut back flowering shoots to two buds, stimulating more side shoots to form, which will flower the following winter. Not only will this will increase the amount of flower, it will also keep plants more compact. Thin out over congested growth from time to time. Recent breeding has transformed this much-loved British native climber. Walk along any woodland or hedgerow and you’ll spy our native honeysuckle or woodbine, Lonicera periclymenum clambering over twiggy obstructions to dangle its clusters of creamy-yellow sweetly-scented blooms in the summer sun. Honeysuckle is one of the delights of the countryside experience, so it’s no wonder this deciduous to semi- evergreen twiner has long been grown in our gardens, where its distinctive two-lipped snap-dragon-like flowers entrance and delight. In recent years its usefulness to wildlife has also been realised, seducing moths and long-tongued bees with sugary nectar, and birds with the juicy, red berries it produces in autumn. It’s quite variable over its European, Mediterranean and East European range so its unsurprising a number of natural variants have been introduced over the years, such as rhubarb pink-flushed Early Dutch honeysuckle ‘Belgica’, and deeper pink-flushed Late Dutch honeysuckle ‘Serotina’, pale yellow ’Graham Thomas’ and ‘Sweet Sue’. Recent years has seen various attempts to improve honeysuckles garden worthiness in terms of compactness, so they can be used in smaller gardens, pots or even used as ground cover or informal dwarf hedges. These dwarf forms need less training, simply a light clip to keep them neat and under control after they have flowered, the time when most honeysuckles are ideally pruned. Clambering honeysuckles prefer to have their roots in cooler, moisture-retentive soil, but their heads in sun or dappled shade. In drier conditions or if stressed, they tend to attract mildew diseases, which can cause them to drop leaves prematurely. These more recent forms are more disease resistant and more adaptable in terms of positioning, so there’s no reason not to give them a try! There’s far more to this group of plants than the familiar annuals. 2019 has been nominated ‘Year of the Nasturtium’ to promote much-loved annual Tropaeolum majus. While these easy-to-grow South American plants have sensational, jazzily coloured flowers there is much more to tropaeolum. They are incredibly diverse, with annual climbers as well as a range of tuberous perennials, equally exotically flowered, that more adventurous gardeners might want to try. The annual species composed of T. majus and Canary creeper T. peregrinum will grow almost anywhere in full sun and are easily raised from seed, either planted directly or grown in pots under glass and planted out after the danger of frost is passed. 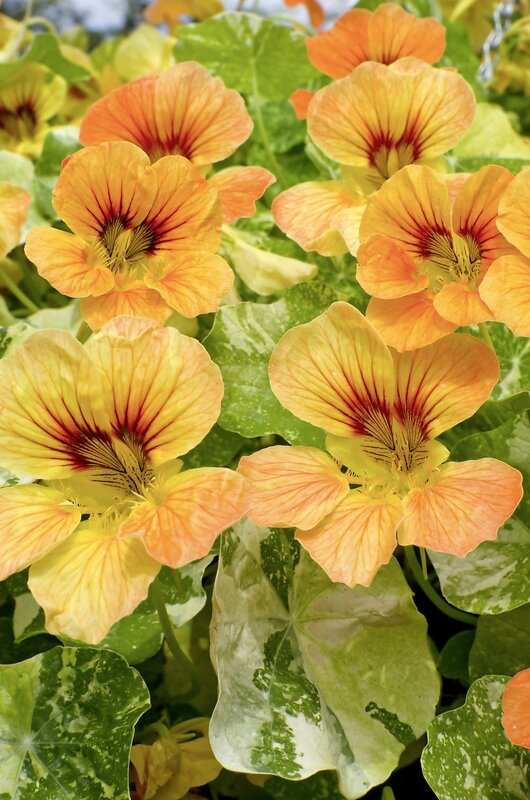 Nasturtiums are great at quickly clothing bare soil - they will even cover ground around bamboo stems to great effect. The flowers are edible too and make mildly peppery additions to salads. They are, unfortunately, prone to infestations of blackfly, which will need to be controlled with fatty acid solutions or pinching out of the shoot tips, where most of the pests congregate. Left alone, they will soon make your prized display look very dishevelled. The deciduous tuberous species are quite different, preferring their tubers to be in moist, but well-drained soil, but with their slender shoots able to clamber over supports into the light, where they variously flower from early to late summer. The flame creeper T. speciosum prefers cool, damp air to do well, and is a feature of many Scottish gardens in September and October. T. polyphyllum flowers in June and looks good when allowed to grow over a scree in a rock garden. T. tuberosum needs a warm spot, where its long-spurred flowers appear from August. Try enchanting T. tricolour in a deep pot of gritty loam-based in a cold greenhouse, where its multicoloured flowers will attract gasps of admiration before it dies down and becomes dormant in summer, before starting again in autumn. Use dwarf and clump-forming varieties to create impact in your garden. Bamboos can profoundly change the character of a garden such is their deep association in the art and culture of China and Japan, where many garden types come from, but they are widespread across most of the tropics and subtropics. In recent years they’ve become very popular, particularly those with colourful or shapely canes, known as culms, where they impart a serene elegance to beds and borders. Naturally growing on the edge of forests or in forest clearings they are deal for semi-shaded positions and look good in large pots in paved courtyards. They’ve also developed a reputation for being invasive and while some do have expansive tendencies problems usually arise when they are squished into inappropriately tight spaces, or planted too close to loose paving or boundary fences. Others, such as those presented here are clump-forming (known as sympodial types), and although spreading they do so relatively slowly, rather than throwing out distant rhizomes (known as monopodial types). The root and shoot systems of garden bamboos usually stay in the top 30cm (12 in) of soil, so placing an impenetrable barrier, such as a paving slab on edge or using a flexible bamboo barrier (visit www.deeproot.com) will help keep them contained. The clump formers are also better suited to growing in large pots or half barrels, ideally in a general purpose and John Innes blended mix, with additional grit or Perlite added for drainage. The best forms of bamboo are expensive as they can only be propagated by division of the rootstock and are slow to establish. In the open bamboos like moist, well-drained soils, ideally with plenty of organic matter and dappled shade. Avoid sites which are continually hot and dry. Once planted keep them watered, especially in dry periods as they will suffer if droughted. This evergreen species comes into its own in the winter garden. The evergreen parsley or fern-leaved clematis, Clematis cirrhosa balearica is one of the saviours of the winter garden, flowering as it does between December through to March, a time when every flower is to be cherished. The species comes from the mountains and valleys of Southern Europe, the Mediterranean and North Africa, including the Balearic Islands after which it is named. The plant is clothed in small, glossy, dark green lobed leaves on twining stalks which enable it to scramble and secure itself to supports. The foliage often becomes bronze tinted in winter. From December through to March clusters of small bell-shaped creamy-green flowers are produced, each variably spotted in maroon. They are also said to have a delicate citrus scent. After the flowers have faded feathery seed heads are produced in spring. Most varieties are derived as distinct colour forms found in the wild, while one, Advent Bells, is a recent hybrid crossed with a related species from China. It will need training to a support and tying in, especially in the early years, so it covers the surface evenly, and doesn’t become congested. They can also be draped over a gazebo or arbour or used to clothe old an old tree-stump.They don’t need any pruning, except for trimming and keeping them in shape. Fern-leaved clematis prefer a sheltered, sunny site, preferably south or west facing. 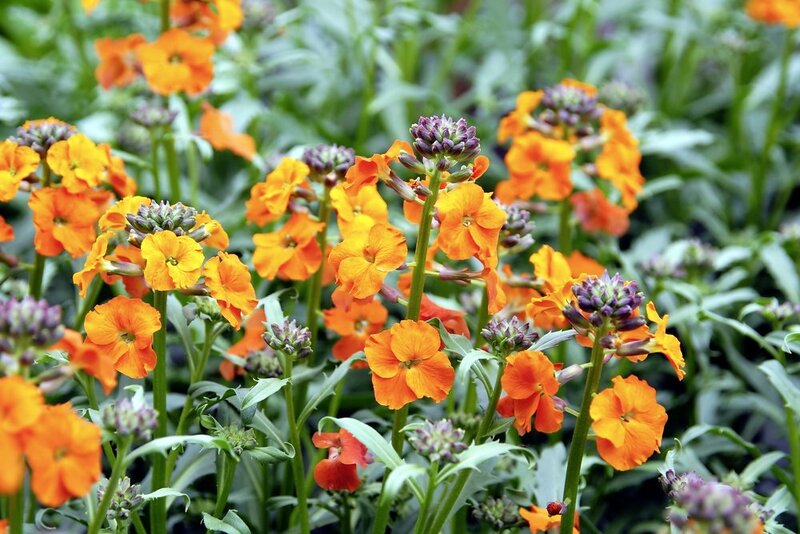 They will grow in most moist, well-drained soils, but won’t stand being waterlogged in winter. They are also effective grown in large pots or tubs, but will need adequate support and training, so they don’t turn into an unruly tangle. Now’s the time to plant them bare-root, and it’s cheaper too! Everyone loves roses, but these days few can afford the luxury of a dedicated rose garden, or even a bed full of gawky hybrid teas and floribundas. With space at a premium, roses are now integrated among other plantings, particularly perennials, and must be repeat flowering and with effective disease resistance, which is why modern shrub-types have become the go-to roses of choice. They are made of a number of different types, notably rugosas, hybrid musks, both Modern and English roses and ground-cover types, collectively possessing a tough, shrubby constitution, well-clothed in foliage. Their variety of habits also lends them versatility, with some making climbers, if pruned and shaped accordingly, others happy in pots, while others are effective and covering the ground. The English roses, bred in the last 30 years by David Austin are justifiably popular, with old-fashioned floral styling and good to excellent fragrance on a four-foot shrub. Others come earlier breeders such as Edwardian rosarian Joseph Pemberton, who bred Felicia, or Ann Bentall, who introduced ‘Buff Beauty’ and ‘Ballerina’, while there are also simply striking selections from wild species, such as Rosa rugosa. All are easy to grow and our selection below gives an indication of the range available, all of which can be planted bare root from now until May. On receiving your plant, untangle the root system and prune off any roots that are broken, and trim back over long roots to 20-30cm (8-12in). Pop the bush in a bucket of clean, cold water for at least couple of hours. You can also use a mycorrhizal root dip to aid establishment or mix similar preparations into the planting soil, additionally adding a slow release fertiliser. Plant with the graft point just buried blow soil level, firm in soil and water in. Prune shoots so they are uncrossed and evenly spaced. They light up the garden and now’s an ideal time to plant them. There’s something rather brilliant about using foxgloves in the garden. With a minimum of expertise and effort when planted in drifts their collective spires transform the most mundane of plantings, turning it into some rather spectacular and out of the ordinary. Our British native species Digitalis purpurea is such an adaptable plant, producing its stately spires of tubular pink or white, dark spotted blooms in the poorest of soil, as long as it retains some moisture in either sun or shade. Breeders have also got to work creating a range of other tones, such as peach or apricot to pure white, with various spotting patterns and flower arrangements. Other species with different flower colours, such as yellow or bronze tones have also become an established part of the floral repertoire. The plants form clumping rosettes of leaves, each forming a single flower spike, usually blooming in succession, rather than all at the same time. The flowers are especially attractive to bees, so are excellent pollinator plants. The bronze forms with slender spires and narrow or white-felted leaves do best in sunnier positions, among border perennials, while the leafier kinds, particularly D. purpurea are better in shade among ferns, primroses and other woodland plants. If you want them to self-seed allow the seed pods to open, otherwise cut them down, or thin out the spikes after the flowers are over to reduce the amount of seed spilt. With shorter-lived types try to establish rosettes of different ages, to help maintain a succession of bloom. Digitalis are generally biennial, sometimes annual, especially if they are sown early in the year, or perennial, sometimes short-lived lasting around 3-4 years. They are easy to raise from seed, and many species will self-sow then happy, but can also be bought as young plants. These award-winning varieties will bring springtime zing to your garden. Tulips are one of the iconic blooms of the spring garden. It’s now the right time to plant them, but as there are 15 different categories of tulips, spanning thousands of varieties it’s very easy to be overwhelmed by the sheer range of types, shapes and colours available. Thankfully the RHS has given its coveted Award of Garden Merit (AGM) to a number of them so you can be assured they will not only look good, but will perform to their best. They’re ideal for use in bedding schemes, in vacant ground between shrubs and roses and among emerging perennials. Select types that are tall enough for the purpose, rather than being hidden or swamped by other plants. All taller varieties make excellent cut flowers. Tulips need an open position, sheltered from strong wind, which will damage the display. Almost all tulips prefer fertile, and moist, but well-drained soil in full sun. They prefer neutral to slightly chalky soil, rather than acid, but overall won’t tolerate wet conditions. They are also excellent in pots, but add grit or Perlite to the potting compost for drainage. Tulips are easy to grow and look for top size bulbs for added vigour and reliability, avoiding any with traces of blue mould on them. Remove the papery skin before planting if this is present. Simply dig a hole 2-3 times the height of the bulb and the same distance apart. Position all the bulbs first to gauge the overall effect before planting. Most bedding tulips are best re-planted in autumn after being lifted and dried over summer, but some such as those derived from T. kaufmanniana, T. fosteriana and T. griegii are more reliable and will flower again in successive years without lifting. To lift remove the spent flower heads and allow the foliage to die back, usually around two months after flowering. Lift the bulbs, keep the best, remove soil, clean and place on a tray to dry or store in hessian bags in a well-ventilated place, at a temperature of around 18C (64F). Replant the bulbs again in mid to late autumn, replenishing with additional new bulbs as required. Look out for the smaller varieties of this valuable autumn tree. Berries are such a visual treat in autumn, with many ornamental trees and shrubs laden with colourful fruit. 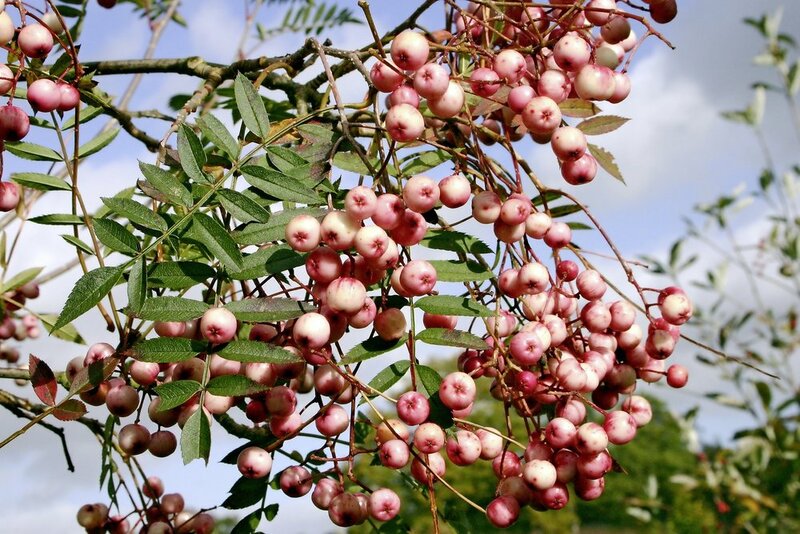 While gardeners are spoilt for choice, if you’re looking for a specimen tree to make a statement then the smaller, more compact rowan or sorbus species and varieties are really worth considering. Their long-lasting displays of berries, which hang on the tree for weeks, if not months, are unsurpassed, nestled among a backdrop of scarlet, orange and yellow-tinted foliage. Berries vary in tone from red, yellow, orange, apricot to pink and white, many of the latter often possessing a deeper pink eye. Their elegant foliage is composed of rounded leaflets spaced like the rungs of a ladder, while the flattened heads of white flowers in spring is attractive to both gardeners and insects alike. Once fully grown, they also cast a light shadow meaning that you can plant beneath with smaller shrubs, perennials and bulbs. Rowans come from the cooler, more mountainous parts of the northern hemisphere, from the USA and Europe, via the Himalaya and into China and Japan. They are tolerant of most soils, doing best on moist, well-drained loams. They are also very hardy, preferring full sun and thriving in more exposed, windy conditions than many other tree species, but won’t thrive in constantly wet soils. While most are readily available grown in containers which can be planted at any time, you can also purchase them bare root, planting these from November to early March. Rowans are susceptible to the disease fire-blight, which causes new growth to look scorched and die back. It attacks many trees and shrubs in the rose family, such as pyracantha. Unfortunately, there is no cure, so if you already have other woody plants already infected by fireblight, it’s best to err on the side of caution and choose something else instead.